Another player who appears to still be growing is Duke freshman Justise Winslow. He measured 6-4 ½ without shoes in June of 2013, but seems to have grown an inch and a half in the span of a year, and will likely be listed at 6-7 at least. He also added 11 pounds to his chiseled frame in that time. 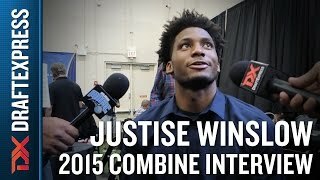 The youngest player on the roster, more than two years younger than seven of his teammates making the final cut, Justise Winslow started off the camp slowly, but eventually showed why he's such a highly sought after prospect. Winslow doesn't look the part of someone who just turned 17 just a few months ago, as he sports a strong, mature frame that helps him significantly against the older players. The son of former NBA draft pick Rickie Winslow (who also played in Spain, France, Italy and Turkey), he is very mature off the court as well, carrying himself with confidence and humility, which easily allowed him to fit into the group. Winslow is a physical, high energy wing player with an excellent feel for the game. He is extremely competitive defensively, but is a terrific passer on top of that, looking like a real team player, which undoubtedly helped his cause significantly in making this squad. He is very good in transition, and also a solid rebounder, even if his skill-level in the half-court, particularly his perimeter shooting ability, still needs a good amount of work. It will be interesting to see how much Winslow is able to contribute on this squad after being arguably the most important player on the USA Basketball U17 World Championship squad last summer. He'll likely have to take somewhat of a back seat to the older players on the roster, but should be ready to step in and provide energy when called upon. Outlook: Michael Kidd-Gilchrist esqe competitor. Shows a tremendous knack for shutting down the opposing team's best player. Played an instrumental role in USA Basketball winning the U-17 World Championship. Poised player with a terrific attitude. Will have to work hard to polish his offensive skill-level to round out the rest of his game.